So. This is my 50th, yup, FIFTIETH post on this blog. Back in February, I celebrated my 50th birthday (I know, I don’t look a day over 49! ), and in the same week, I started this blog. Inspired by having the belief to be a ‘writer’. That belief coming from the ‘me’ that is the ‘me’ that I never knew I could be. As regular readers will know, I attribute this ‘me’ to the wonderful world I am humbled and so fortunate to share with my incredible wife, Nicky. The first blog post was inspired by, what I believed to be, a bit of elitism, a bit of snobbery, as we struggled to our epic DNF at Portland way back then. Check out that post here. 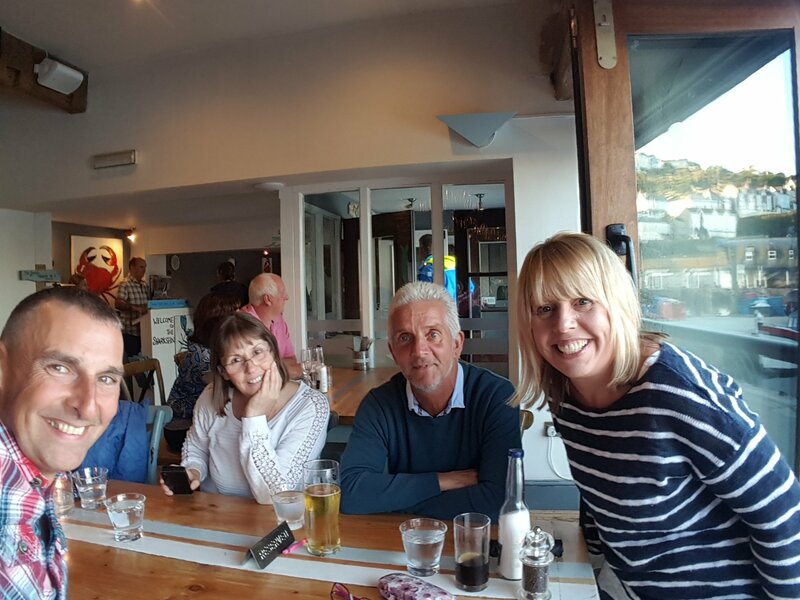 I went straight in to writing another post inspired by our fantastic holiday in Cornwall, and witnessing the incredible boys and girls taking on the Arc Of Attrition. Maybe have a read of that too, here, if you fancy. The Arc Of Attrition. I don’t think it’s any longer a secret……. 2019……. Having been told to ‘Man The **** UP!” by the afore mentioned Nicky, she gave the me gift of a journal to record my journey to attempting a 12 hour race, The East Farm Frolic. Every day is like Christmas, the gifts of love, laughter, of adventure and of sharing life…. I truly feel like my heart has won the lottery. Every single day. The gift of this journal is so symbolic, I’ve been to some dark places, literally and metaphorically, in the past. And here I am in the light. In the quiet. Inspired. People from 61 different countries have read this blog (over 8000 times!). Hello South Korea, thank you for tuning in. It’s rather humbling to think of somebody in Brazil, Bulgaria or Bahrain taking the time to read my words. So, as I suspected, I really, REALLY enjoy writing. I really, REALLY enjoy running and the running community. That’d be a marriage made in heaven then. What a coincidence….. So, here we are, 6 months later, after plenty of adventures and events. One of us has smashed their marathon PB and achieved even more open water swimming goals (neither of them were me!). One of us smashed their marathon PB in May! We’ve done marathons, 10ks, ran in heat, in mud, in Cumbria and Snowdonia. There’s been incredible tales of achievement in our family, young and old. There’s been chips, and pasties and cakes and ice creams (apart from when we’ve been ON IT!). There’s been an almost political post, and I’ve touched on the pressures domestic life can stretch us, and how we support Nicky’s Dad. But mostly, it’s been about running. Oh, and me gushing about Nicky, much to her embarrassment. She’s been at it again this week, inspiring and relentless. Last weeks RAT (see blog here) came in the middle of her preparing for a job interview and presentation….. Which were both successful. I don’t mind embarrassing her, I think we’re a great team and my pride in everything we achieve in life, and in being half of that team, swells by the day. I have ideas for the blog and, as and when time allows, hopefully some of these will appear on this hallowed page. Maybe some interviews, maybe some more feature type posts. Any suggestions welcome…. In the meantime, I’ll keep plugging away sharing thoughts and ramblings on this amazing journey that is life. The blog isn’t thrown together but there is improvisation. Last weeks post was pretty much composed whilst sat on a bag of cement during my breaks at work. “I’m retiring. Yup this is my last ever ultra. Uh huh, it feels good.” Nicky (my rather gorgeous lady wife) proclaimed to anyone who’d listen. “Without question, this is my favourite event EVER, and I’m coming back next year to do The Plague” I equally enthusiastically declared. Again, to anyone who’d listen. Mudcrew’s The R.A.T. trail running races. As David (one of the kit check guys) declared, this is the Christmas of trail running. 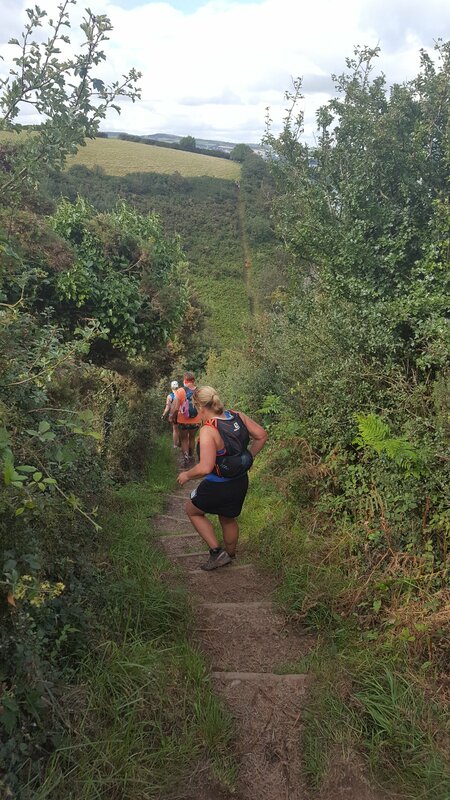 All run on the breathtaking Cornish coast line, there are 11, 20, 32 & 64 mile options. Four years ago, unbeknown to us, we were about to become a couple. 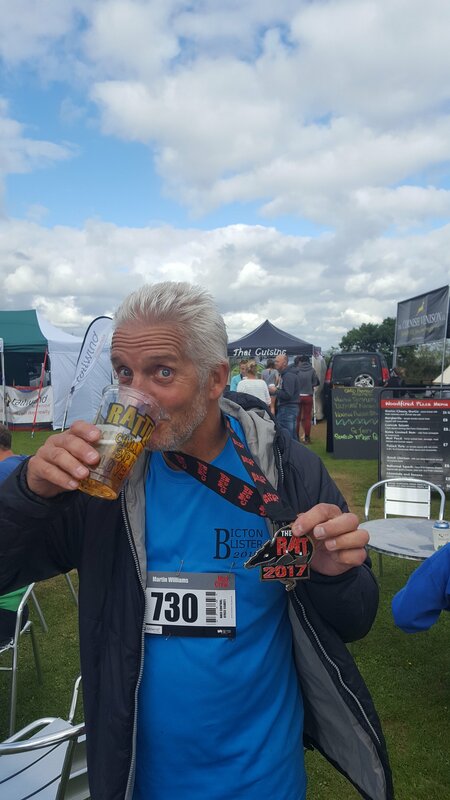 Nicky was here completing the Red Rat (20 miles) and I was burying myself in eyeballs out road training, chasing faster and faster times….. 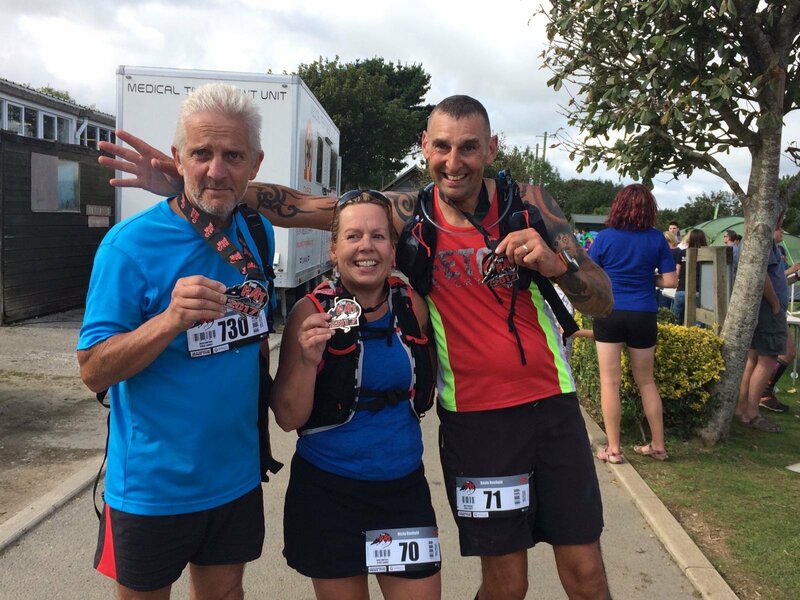 Here we are, now 3 time veterans of The Black Rat (32 miles), absolutely basking in our unapologetically self congratulatory glory of another medal well earned. This is pure running adventure. “Does anybody else fancy driving this down these lanes?” enquired our chatty coach driver as we inched our way towards St Anthony’s Head. An hour earlier, four coaches left Porthpean at 7 am after a safety presentation and welcome from one of our incredibly enthusiastic race directors. A small bank of portaloos welcomed us to the National Trust car park at St Anthonys, and our good friend and fellow adventurer Martin made short work of the sprint from the bus, ensuring a clean seat and fresh paper for his pre race rituals. Some nervous chattering and shivering as we awaited the clock to strike 8.30 in the morning drizzle. Like the security guys in the car park, during registration and at kit check, numerous smiling, happy and enthusiastic Mudcrew marshalls were overseeing the start. Before we knew it, we were off. 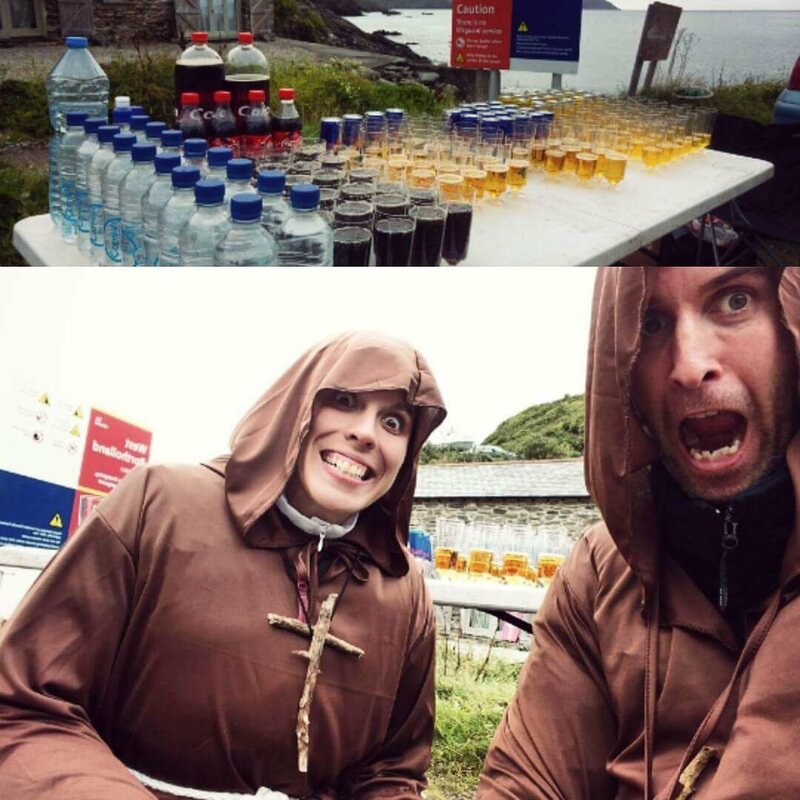 Straight on to the coast path, encountering a couple of Plague runners (these guys had started at 5 past midnight and were doing the course as an out and back 64 miles) who still had time to make the turn before the 9am cut off. They received much applause and encouragement, it had been a rough night of weather in the dark for those incredible chaps and chappesses. It goes up….. and down…. A LOT! Apparently the leading pair turned by 6am!! And finished in just over 12 hours, a mere 6 seconds apart. Last year, with us not quite so well prepared, the field had eased away from us quite early and we didn’t much change our position throughout the race. Cooler air this year, and Nicky stronger than ever, carrying Snowdonia’s efforts of a mere 20 days previously, but relentless. The first checkpoint appeared in no time. As always, attentive, thoughtful, encouraging and knowledgeable crew, in numbers, to ensure we had food, drink and no ailments. Onwards. Tucked well up into the pack of runners, Nicky, watchless, pushed on towards her alleged retirement, unaware that we were putting time into our previous best on this course. Running the runnable bits and marching on the tricky bits and eating up the steps. The Roseland Peninsula offers a new and spectacular view after every turn, picture postcard fishing villages and terrain to test even the most hardened trail runners. Lots and lots of steps. Or ****ing steps as they increasingly became known as morning became afternoon. The second checkpoint, at Portloe, also served as the starting point for the Red Rat (20 miles), those runners having been set on their way some 30 minutes before our arrival. As I double checked that we truly were going as well as I’d thought, we were again fed and watered by the incredible team of volunteers. Seeing us on our way with huge cheers and encouragement. It’s quite a while before the next checkpoint, but again, despite this, time just flew by (as it always does when we run together) and we were still catching the odd fellow Black Ratter and occasionally a Plague infected warrier. “The night? It was a ****ing nightmare!” said another. “No!” said another, head down, determinedly trudging on after a mere 45 miles or so! I didn’t push for an elaboration! I’d better not turn up unprepared next year either, there’s nowhere to hide and no easy way on this course! 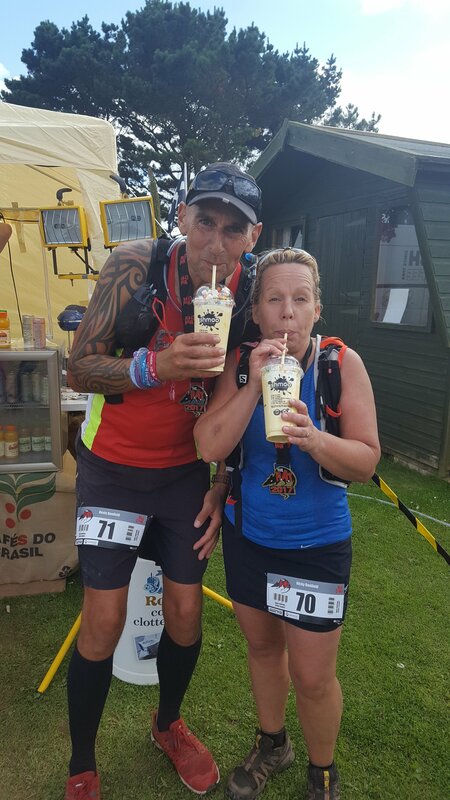 Two ultra veterans, Jessica and Duncan Williams set up a ‘pop up’ aid station at Port Holland. This is an annual tradition and their ‘P’ themed fancy dress this year was priests……. a very welcome drink and great to see Jessica, one of the runners we had cheered on in The Arc Of Attrition back in February. That was back when this blog was a shiny new thing – read that post HERE if you fancy. I managed to resist tempatation twice in Mevagissy, firstly the incredibly smiley and enthusiastic marshall offered us chips!! Secondly we actually passed within 100 yards of our B & B for the weekend and it’s warm shower and welcoming duvet……..
That’s our lovely snuggly bed just up there! This last 10k or so is probably the toughest we’ve encountered in any of our events, the climbs, descents and ****ing b****** steps go on and on and on. This final 10k section also starts with the most atmospheric aid station and checkpoint I’ve encountered in trail running. The Ship Inn at Pentewan shares its outside space with The RAT for the day. The busiest checkpoint of the day even has ice pops, refreshing water melon and yet more attentive, caring and knowledgeable crew. Filling your water bottles, fetching your fruit and looking us square in the eye to check we were as we should be. Or the best we could be at this stage of the race! They know what they’re looking for too. Over 60 successful 100 mile events have been completed by the Mudcrew crew on duty. With the pub having live music in the garden, and it now being well into the afternoon, there were some quite beery cheers too, to set us on our way. We could not have been in safer hands, with the addition of fabulous medical cover and massage on duty at all the checkpoints, all we had to do was enjoy it!!! “I don’t care how long it’s taken, just happy to get it done” lied Nicky as we trudged up that last hill. “We’re on 8 hours and 9 minutes and the finish is literally just at the top of this hill” I remarked, this being the first time I’d shared our progress on the clock with Nicky. It sure was. Feeling like superstars as we held hands and sprinted (well, maybe not actually sprinted) for the line. Great big smiles all around. Catching Martin’s eye as we were presented with the medals (7h30m for the Silver Fox, chapeau sir) there was an exchange of fist pumps. This moment was caught beautifully on camera by our number one supporter Gloria, another RAT ever present, cheering everyone home in the fabulous crowd at the finish. All three race directors (this event is 18 hours long, never mind the time before and afterwards for the organisers) cheer, hug, back slap or shake the hand of every competitor across the four distances as they head for the line. Martin made short work of a couple of Rattlers! I don’t mind saying I’m proud. Firstly, my bursting pride to be able to share such wonderful adventure with the most incredible, beautiful, inspirational, HOT lady in the WHOLE world! Proud to be part of this top, top event and amongst the best of the best in the trail running community. Proud to share the weekend with such great friends in Gloria and Martin, who make the whole experience so much fun. Sunday morning, not quite so mobile! Do you know what? I’m proud of myself. I don’t apologise for having a moment of self congratulatory indulgence. These endurance tests aren’t for the faint hearted and preparation and the hours in training are essential to maintain the effort level and to have maximum ENJOYMENT on the day. Two weeks until the Frolic now, I’ve put in lots of miles but probably not as many as I would have needed to be doing if I was to be in with a chance of hitting my secret target…..
She is joking isnt she???? I’ve started listening to Talk Ultra. So now, that’s 3 podcasts I heartily recommend. The other two being Running Commentary and Marathon Talk. I feel like a bit if a fraud. It certainly is a reality check listening to all those interviews with participants, including both elite athletes and mere mortals like us, about mammoth endurance events such as the Dragons Back and The Sky Running events. BUT, Nicky and I are veterans (in both age and events) of 10 years of running events. Both of us having completed 30something marathons, including a few 50km races and, in Nicky’s case, a 50 miler. AND, I’m having my post prolific year yet of mileage, averaging over 200 miles a month. Does this man look like he could ‘go long’? SO, maybe I am ready to step up to call myself an ‘ultra’ runner…. I mean, I’ve got some Inov8 shoes and a rucksack and everything! As regular readers will know, I’m leading up to The East Farm Frolic (EFF) in August where I’m looking to keep going for all 12 hours and hopefully take myself into the 50 mile club, if not further. AND, listening to this new (to me) podcast is only fuelling my desire to ‘go long’. 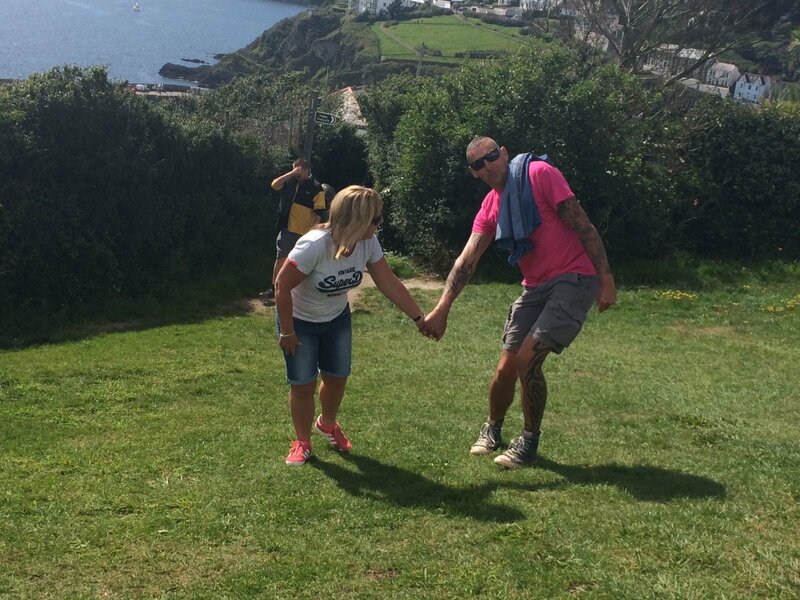 Specifically to ‘go long in Cornwall’……. Which got me to thinking….. my beautiful lady wife, chatty Martin and good friends Jan & Gloria had formed a relay team to compete for the 12 hours at The EFF. All change now as they have moved to being solo entrants, like yours truly. With 5 of us now entered….. surely 5 go long in Dorset….. Anyway, by going long in Cornwall, I mean specifically go long from Coverack to Porthtowan, by way of 100 miles of the coast path, in February 2019. I fell for the charms, the challenges, the tales of successful and unsuccessful attempts, the beauty, the uniqueness of The Arc Of Attrition (AOA) as we spectated back in February, see my blog post from back then. In fact one of the reasons I was so inspired to start blogging get so enthusiastically was the wonderful experience of following this year’s edition. Quite a mandatory kit list for The Scrooge! The AOA is organised by Mudcrew, responsible for my absolute favourite event, the (black) RAT and many otherwise including the festive hilarity of The Scrooge. Mudcrew’s head honcho, Andrew Ferguson, is a pretty serious ultra runner himself, recently competing in the fabulous looking Laverado Ultra in Italy , and his name pops up all over the trail running scene. All who crew at these Mudcrew events are runners and understand the needs of those on the trails. It would not be an exaggeration to say that I think about the AOA, and how I will prepare, on most of my runs. Ultra ready? Ahh, no beard! By that I mean I try relate the run I’m on to how I would be feeling after 24 hours of coast path. I think about eating proper food whilst running, about kit, navigation, isolation, weather, etc etc. I’ve also developed a new mantra, “NO LAZY STEPS’ meaning I should never assume the next foot plant is flat and predictable. Small protruding roots under dark tree canopies could end the race. I need to make sure to learn to remaim alert under extreme fatigue. The enormity of the AOA’s challenge has dictated the time scale. I need to qualify, I’m hoping to have a few events which serve as qualifiers, maybe doing something like Hope 24 amongst them. The traditional Mudcrew stepping stone is to do the 100k version of the RAT (Nicky and I are doing the 50k for the 3rd time this year) in 2018. The Plague, as this 100k is known, serves as a qualifying event and also comes with an AOA invite to accompany it’s finisher’s medal. The best part of all of this process is spending time outdoors, with my wonderful amazing beautiful lady wife, Nicky. After the great adventures of last Saturday (see last post) we took to the coast path for 3 gloriously hot and sweaty hours. A tad wiffy, but bring on Snowdon! These joint jaunts are serving as training towards Snowdonia for the two of us (which is rapidly approaching! ), as well as building my mileage towards The EFF. They are also wonderful shared adventures, precious and treasured times. 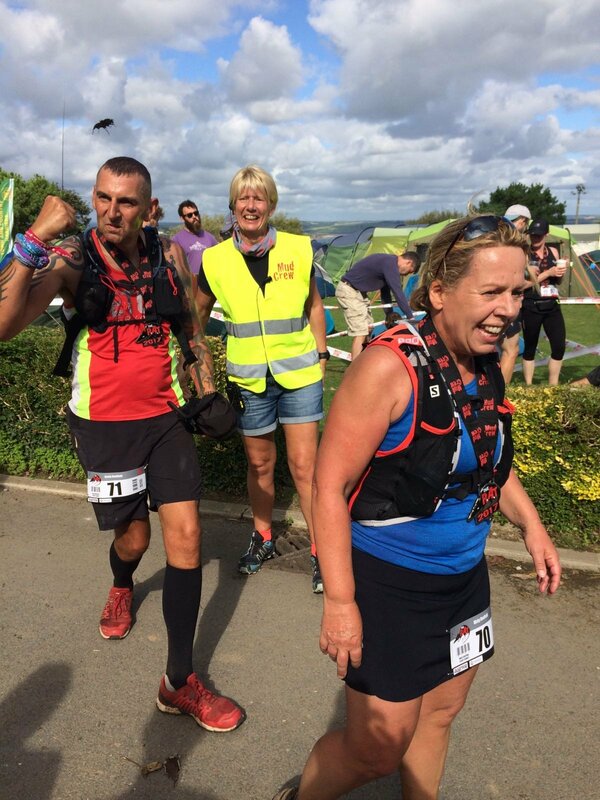 Oh the witty banter on these sweaty long runs, “blimey you stink” “not as much as YOU stink”….. The Talk Ultra podcast is presented by Ian Corless, a fine ultra and trail runners in his own right and now an event photographer too. The show is mainly made up of interviews with big names from the world of ultra-distance running, as well as those from further down the field. It’s all an education to me, probably only being aware of the headline events and maybe our local long distance challenges. I’m learning the names of the stars of this mystical world and getting to grips with the lingo. Don’t expect me to be attempting a FKT on a course with loads of VERT anytime soon…..
Oh it turns out my 20 miles running, to Teignmouth, on the coast path, isn’t even a warm up to most of these boys and girls. We’d elected for this instead of waiting another hour and going to the club night. Whilst I was cracking paving slabs either my clomping strides, Nicky and Charlie joined the rest of Paignton, walking along the sea front. It was with some relief that I finished my effort near a toilet. Then, whilst not getting any cooler during my cool down, I bumped into my beautiful wife and raggerty hound and needed no further prompting to end my rather unfortunate effort RIGHT THERE. A stroll back along the beach followed by eating chips on the sea wall and all was well again. A few years ago I’d have been disappointed with that run but these days I enjoy laughing at myself and moving on. 3.75 of jogging with Charlie in the woods at 5.30am this morning soon put that right too. Something similar tomorrow then a weekend of long endurance adventure beckons, including some kayaking to accompany the intrepid Mrs Bonfield on an early morning river dip. Enough of this rambling, keep on keeping people……..
A silly pet name, really, what with, you know, us being ON IT and everything……. SO, I shan’t go on and on and on about just how wonderful my life is with Nicky…. well, only a bit……. Met a blog reader(!) and fellow Marathon Talk listener Millsy at the start – he came 10TH – good running! Hang on, the cut off at 20 miles is 4 hours (12 mm). Oh, really, well, we’ll get to that relatively safely and even if we are tiring, that would mean we had 1.5 hours to do the last 10k (and as we now know, the last 3 miles are pretty quick). Smashing, we could average high 11’s and see how we felt at 20…..
Oh, HANG ON, the cut off at 8 miles is 1.5 hours, that’s 11m15s per mile!!! Er, why?? Anyway, I tried not to let this concern me as I set about pacing Nicky as best I could to this first cut off point. I can’t tell you too much about the course, as I was trying to get the right effort out of Nicky without burning up valuable energy for later in the race. Started at the back. Whoops! We ALWAYS start at the back. This serves two purposes – firstly, it avoids being dragged along by runners going faster than we should be and secondly it stops the demoralising process of quicker runners coming by as they find their place in the field. This was a mistake today! It took us exactly a minute to cross the start line. After a lap of the Cornwall College site we hit a rather bad bottle neck. Stationary. 90 seconds. Then, an uphill very narrow grass path, at a gentle walk as there were plenty of half marathon runners enjoying the greenery as they were, of course, under no time pressure. How much quicker might we have done this section, maybe 30 seconds, maybe a minute? One of us struggled under the tunnel…. The final nail in the coffin of our marathon was when we passed the 8 mile marker with 1h29m50s showing on my watch but with no sign of the split. A few hundred yards later we were 2 minutes too late for the poor chap charged with the task of informing us! You were bravely firm and apologetic sir and I hope we weren’t rude! We completed the ‘half’ in 2h28m feeling bright and fresh, a bit cross(!) but could merrily have gone around again. These lovely (ultra veterans) were also not up to standard today!! Such a shame that my beautiful wife, a seasoned veteran of 30 marathons, including a 50 miler, 4 50ks and numerous tough off road events is now saying that she feels that she simply isn’t good, or indeed, fast enough. I guess we’ll just have to be more careful to ensure races we enter are aimed at runners like us. A cracking venue and course, numerous and enthusiastic marshals and volunteers and an inclusive half marathon with no time pressure. Not all doom and gloom though, a pasty and an ice cream as we chilled on the beach at Charlestown was just splendid, followed by a lovely evening and night in our favourite bolt hole in Mevagissey. Definitely a 2 ice cream day. And now we look forward to some lovely weekends of running and Nicky is getting right back into her open water swimming again. Hopefully I haven’t come across as bitter and twisted. As I said to a nice chap in a Mudcrew vest as we stomped our way through the last few miles, I need to shut the wotsit up and stop moaning. “Oh no, he said, if you’ve developed a life skill you should definitely use it!”! !